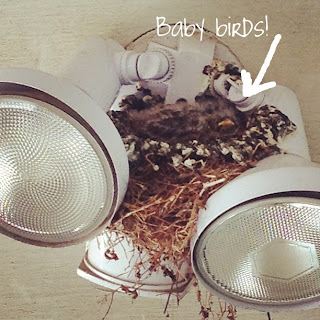 Our family has been watching a Mommy or Daddy bird spruce up a pre-existing nest that is in our carport for a few weeks now. We have even climbed on top of my SUV to see if there were any eggs, but there weren't. We still kept our eyes on birds flying in and out of the nest and the boys questioned what they were doing. Sure enough though, at some point, there were eggs and just yesterday we heard some frantic tweeting and chirping! We looked up and saw 3 baby beaks reaching up looking for food! Mommy bird had just flown off, maybe because we scared her, but maybe in search of food. It started me thinking about how we, as parents-to-be (and no, I'm not a parent-to-be, but a very-content-with-our-numbers-Mommy), spend all kinds of time preparing for our little ones to arrive. We have 9 months to prepare our hearts and minds and 9 months to get a nursery ready, buy baby items necessary for sustaining life (half of which never get used) and often we also find ourselves nesting. Nesting. I think that's what these parent-to-be birds were doing. They fluffed up their nests and waited for their little arrivals. It's not just human nature to prepare, but God's creatures do this too. But often though, once animals are born, they have only a few years with their parents before they are on their own, and some species never even know their parents. They have no one teaching them how to go about life. (I could give you specifics on this, but my 7 year old isn't around to ask right now.) This is not the way humans were designed though. Babies couldn't thrive and survive without someone taking care of them. They are dependent on caregivers for a quite a bit, like teaching them how to take care of themselves and what their purpose in life is! Right now, I feel like I have a nest of baby birds chirping away daily! From, "Mommy! May I please have some milk! I need some milk!" to "Mommy! I can't get my shoes on." From, "Uggh, this won't work, will you help me?" to "Mommy, will you open this?" I have a bunch of littles who need me constantly. Some days I struggle with that. I imagine most parents do at some point. It's hard to get one little thing done without the "Mommy!" chiming in. But other days, when the Lord blesses me with perspective, I think about what an awesome responsibility and blessing this is! We have the privilege of raising 4 boys to learn to take care of themselves and point their hearts to the Lord before they fly out of our nests to do the same thing. Today, I'm thinking and praying about what that looks like over the next 11 years before our first leaves our nest to who knows when our last will. What are you doing to ready your littles to leave your nest? The time is now!